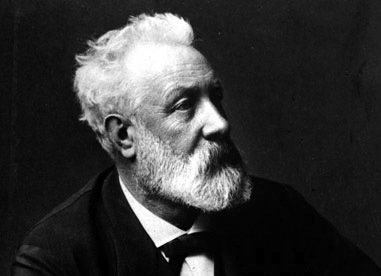 Born in 1828, Jules Verne was a French author who pioneered the Science Fiction genre, describing fantastic technologies that hadn't been invented yet. He wrote a number of intriguing Dystopian Stories, where technology went bad. Verne is the second most translated author in the world, behind Agatha Christie. His most famous novels include: 20,000 Leagues Under the Sea, (1870), A Journey to the Center of the Earth, (1864), and Around the World in Eighty Days, (1873). Anointed the "Father of Science Fiction" along with Hugo Gernsback and H. G. Wells, Verne led a fascinating life. We feature his work in our collection of Dystopian Stories. As a child in Nantes, France, he developed a great interest in travel and exploration, tooling around in the harbor on a boat with his brother. Rumored to have stowed away on a ship bound for the West Indies, his father was waiting for him at the next port, cutting the young Verne's adventures short. After studying at the lycée, then to Paris for law, he began writing verse for operettas with his friend and composer, Aristide Hignard. His true talent emerged writing travelers' stories, characterized with carefully researched scientific and geographic details, interwoven in extravagant voyages and adventures. Verne's father withdrew his financial support when he discovered his son was writing, not studying law, forcing Verne to become a stockbroker for a time (he was moderately successful). His writing mentors included Alexandre Dumas and Victor Hugo. Many of Verne's early manuscripts were rejected by publishers as "too scientific." But he formed an alliance with Pierre-Jules Hetzel, who edited Verne's story about balloon exploration in Africa, which had been rejected by several publishers before Hetzel. Verne added comic relief and changed endings into happy ones, toning down some political messages. This, of course, became the basis for what would later become Around the World in 80 Days. After 1863, Verne published two or more volumes a year. The most successful of these are: Journey to the Center of the Earth, (1864), 20,000 Leagues Under the Sea (1869) and Around the World in Eighty Days (1872). Interestingly, Verne gained most of his wealth from the stage adaptation of Le tour du monde en quatre-vingts jours (1874). Verne was appointed Knight, bought a series of ships, which he sailed around Europe, wealthy and famous. Vernes' writing took on a darker tone later in life. His 25 year old nephew shot him in the leg in 1886, giving him a permanent limp and committing his nephew to a mental institution. Both Vernes' mother and Hetzel, his life-long publisher, died. Hetzel's son took over the business, but was not nearly as rigorous editing Vernes' works, which may have contributed to his less successful later novels. Verne turned to politics, serving on his town council for 15 year. In 1905, Verne died of diabetes. His last novels, Invasion of the Sea and The Lighthouse at the End of the World were published posthumously by his son, Michael.